Ever get the heebie-jeebies at a wax museum? Feel uneasy with an anthropomorphic robot? What about playing a video game or watching an animated movie, where the human characters are pretty realistic but just not quite right and maybe a bit creepy? If yes, then you've probably been a visitor to what's called the "uncanny valley." The phenomenon has been described anecdotally for years, but how and why this happens is still a subject of debate in robotics, computer graphics and neuroscience. 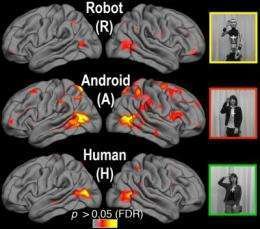 Now an international team of researchers, led by Ayse Pinar Saygin of the University of California, San Diego, has taken a peek inside the brains of people viewing videos of an uncanny android (compared to videos of a human and a robot-looking robot). The term "uncanny valley" refers to an artificial agent's drop in likeability when it becomes too humanlike. People respond positively to an agent that shares some characteristics with humans  think dolls, cartoon animals, R2D2. As the agent becomes more human-like, it becomes more likeable. But at some point that upward trajectory stops and instead the agent is perceived as strange and disconcerting. Many viewers, for example, find the characters in the animated film "Polar Express" to be off-putting. And most modern androids, including the Japanese Repliee Q2 used in the study here, are also thought to fall into the uncanny valley. Saygin and her colleagues set out to discover if what they call the "action perception system" in the human brain is tuned more to human appearance or human motion, with the general goal, they write, "of identifying the functional properties of brain systems that allow us to understand others' body movements and actions." They tested 20 subjects aged 20 to 36 who had no experience working with robots and hadn't spent time in Japan, where there's potentially more cultural exposure to and acceptance of androids, or even had friends or family from Japan. The subjects were shown 12 videos of Repliee Q2 performing such ordinary actions as waving, nodding, taking a drink of water and picking up a piece of paper from a table. They were also shown videos of the same actions performed by the human on whom the android was modeled and by a stripped version of the android  skinned to its underlying metal joints and wiring, revealing its mechanics until it could no longer be mistaken for a human. That is, they set up three conditions: a human with biological appearance and movement; a robot with mechanical appearance and mechanical motion; and a human-seeming agent with the exact same mechanical movement as the robot. At the start of the experiment, the subjects were shown each of the videos outside the fMRI scanner and were informed about which was a robot and which human. The biggest difference in brain response the researchers noticed was during the android condition  in the parietal cortex, on both sides of the brain, specifically in the areas that connect the part of the brain's visual cortex that processes bodily movements with the section of the motor cortex thought to contain mirror neurons (neurons also known as "monkey-see, monkey-do neurons" or "empathy neurons"). According to their interpretation of the fMRI results, the researchers say they saw, in essence, evidence of mismatch. The brain "lit up" when the human-like appearance of the android and its robotic motion "didn't compute." "The brain doesn't seem tuned to care about either biological appearance or biological motion per se," said Saygin, an assistant professor of cognitive science at UC San Diego and alumna of the same department. "What it seems to be doing is looking for its expectations to be met  for appearance and motion to be congruent." In other words, if it looks human and moves likes a human, we are OK with that. If it looks like a robot and acts like a robot, we are OK with that, too; our brains have no difficulty processing the information. The trouble arises when  contrary to a lifetime of expectations  appearance and motion are at odds. "As human-like artificial agents become more commonplace, perhaps our perceptual systems will be re-tuned to accommodate these new social partners," the researchers write. "Or perhaps, we will decide it is not a good idea to make them so closely in our image after all." Saygin thinks it's "not so crazy to suggest we brain-test-drive robots or animated characters before spending millions of dollars on their development." It's not too practical, though, to do these test-drives in expensive and hard-to-come-by fMRI scanners. So Saygin and her students are currently on the hunt for an analogous EEG signal. EEG technology is cheap enough that the electrode caps are being developed for home use.